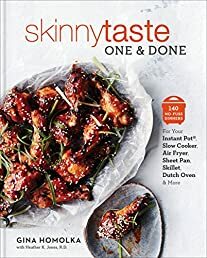 Skinnytaste One and Done: 140 No-Fuss Dinners for Your Instant Pot®, Slow Cooker, Air Fryer, Sheet P | Your #1 Source for Kindle eBooks from the Amazon Kindle Store! For your Instant Pot®, electric pressure cooker, air fryer, slow cooker, multi-cooker, Dutch oven, sheet pan, skillet, and more–140 healthy and delicious recipes that are big on flavor and low on calories and cleanup. Skinnytaste One and Done is the perfect resource for busy home cooks looking for easy, good-for-you dinnertime solutions. #1 New York Times bestselling author Gina Homolka incorporates her healthy, flavor-forward recipes with everyone's favorite way to cook–in one vessel, whether a sheet pan or multi-cooker, and everything in-between. No matter if you'd like to lose weight or just eat a little healthier, this book will make your weeknight dinner routine even simpler with satisfying, all-in-one recipes. Cooking in a single vessel means streamlined dinners with minimal fuss and cleanup–a huge plus after a long day. Skinnytaste One and Done is organized by vessels that include everyday cooking equipment such as an Instant Pot®, a sheet pan, a Dutch oven, a skillet, a slow cooker, and an air fryer. As always, the recipes are big on flavor and light on calories, and now more convenient than ever. With 140 healthy, family-friendly recipes, 120 full-color photos, nutritional information for every recipe, and Gina's signature cooking tips, Skinnytaste One and Done will be a weeknight game changer. Even if you don't own all of the appliances, Gina gives alternative cooking directions using everyday cooking equipment where possible, so you won't miss out. Instant Loss Cookbook: Cook Your Way to a Healthy Weight with 125 Recipes for Your Instant Pot®, Pre.. The Fresh and Healthy Instant Pot Cookbook: 75 Easy Recipes for Light Meals to Make in Your Electric P..